1. A, B and C started a business by investing in the ratio of 5 : 7 : 9. After 1 year, A invested Rs. 10000 more and at the same time D joined them with double the investment of A. And after another one year, B withdraw Rs. 5000. Find the share of C, if the total profit at the end of 3 years is Rs. 139500? 2. A boat can cover 9.6 km upstream in 24 minutes. If the speed of the current is 1/4th of the speed of boat in still water, then how much distance (in km) can the boat cover downstream in 36 minutes? 3. A square and an equilateral triangle have same perimeter. The diagonal of the square is 12√2 cm. Find the area of the equilateral triangle? 4. Two pipes A and B can fill a tank in 18 hours and 24 hours respectively, while a third pipe can empty the full tank in 30 hours. All three pipes are opened in the beginning. After 12 hours C is closed. Find the time in which the tank will be full? 5. 5 years ago, the ratio of the ages of Arun and Praveen is 5 : 6. Present age of Raju is 6 years more than one – fifth of Arun’s present age. Find the ratio of the age of Praveen after 2 years and the present age of Raju, if Arun’s age after 5 years is 50 years? Directions (Q. 6 – 10) Study the following information carefully and answer the given questions: The table below shows the sum invested by different person, rate of interest, time period, total amount they received and the compound interest they received at the end. Some data’s are missing. 6. Find the total amount invested by A, if the interest compounded annually? 7. If the ratio between the principle amount invested by B and C is 3 : 5, then find the rate of interest for C (if the interest compounded annually)? 8. If the total principle amount invested by D is half of the principle amount invested by A, then find the number of years the principle amount invested by D (if the interest compounded annually)? 9. Find the average principle amount invested by A, B, E and F, if the ratio of rate of interest for D and E is 1 : 2 (if the interest compounded annually)? 10. Find the compound interest received by F, if the interest compounded half yearly? 1) A, B and C started a business by investing in the ratio of 5 : 7 : 9. After 1 year, A invested Rs. 10000 more and at the same time D joined them with double the investment of A. And after another one year, B withdraw Rs. 5000. Find the share of C, if the total profit at the end of 3 years is Rs. 139500? 2) A boat can cover 9.6 km upstream in 24 minutes. If the speed of the current is 1/4th of the speed of boat in still water, then how much distance (in km) can the boat cover downstream in 36 minutes? 3) A square and an equilateral triangle have same perimeter. The diagonal of the square is 12√2 cm. Find the area of the equilateral triangle? 4) Two pipes A and B can fill a tank in 18 hours and 24 hours respectively, while a third pipe can empty the full tank in 30 hours. All three pipes are opened in the beginning. After 12 hours C is closed. Find the time in which the tank will be full? 5) 5 years ago, the ratio of the ages of Arun and Praveen is 5 : 6. Present age of Raju is 6 years more than one – fifth of Arun’s present age. Find the ratio of the age of Praveen after 2 years and the present age of Raju, if Arun’s age after 5 years is 50 years? 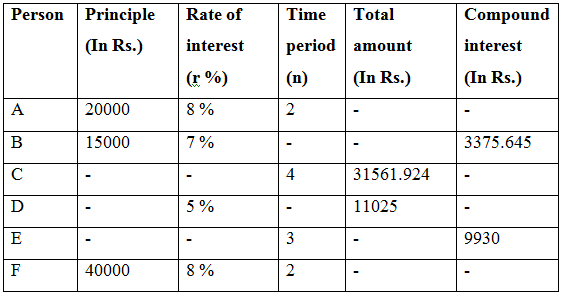 The table below shows the sum invested by different person, rate of interest, time period, total amount they received and the compound interest they received at the end. Some data’s are missing. 6) Find the total amount invested by A, if the interest compounded annually? 7) If the ratio between the principle amount invested by B and C is 3 : 5, then find the rate of interest for C (if the interest compounded annually)? 8) If the total principle amount invested by D is half of the principle amount invested by A, then find the number of years the principle amount invested by D (if the interest compounded annually)? 9) Find the average principle amount invested by A, B, E and F, if the ratio of rate of interest for D and E is 1 : 2 (if the interest compounded annually)? 10) Find the compound interest received by F, if the interest compounded half yearly?